Picks are the virtually unsung heroes of the guitar world. They might not look as cool as a Gibson Flying V or be as impressive as a Marshall stack, but they can make or break a guitarist’s playing in terms of speed, clarity and tone. And the truly studious guitarists who pay close attention to every little playing nuance know the importance of choosing the right guitar pick for the right occasion. Today we take a look at 10 pick packs that we think deliver great value for money. The D'Addario assorted celluloid guitar pick pack is a no-nonsense option for guitarists that run through a lot of picks. The picks are all made out of premium celluloid material and are all .70mm thick and are great for playing both rhythm and lead guitar. These packs also come in 25 pack and 100 pack variations. 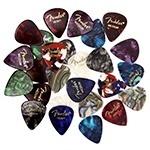 The Fender Premium Picks Sampler contains 24 guitar picks divided into 8 light, 8 medium and 8 heavy gauge picks. 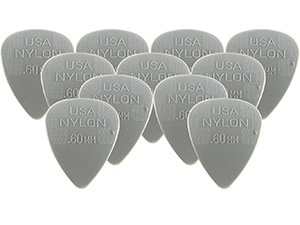 The picks are made out of Fender’s premium celluloid material and offer a warm and well-rounded tone. And while this pack isn’t something you are likely to see a seasoned guitarist pick up at his local guitar store, at just $8.49 it’s a great deal for beginner guitarists experimenting with various pick gauges and the tones that they help create. The picks also come in a variety of colors and styles (although this doesn’t really have any effect on the pick’s playing dynamics) and are also great to have lying around for the occasional jamm session. 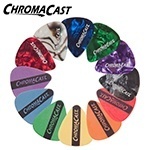 At just $3.15 the ChromaCast 12 pick sampler pack is another great value-for-money pick pack for beginner players experimenting with various pick gauges. 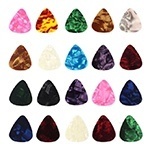 The picks come in extra thin, thin, thin/medium, medium, medium heavy and heavy gauges. 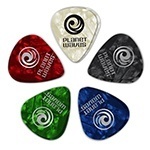 The 12 pack includes both celluloid picks and Dura picks and are crafted in a classically rounded pick shape, offering a warm sound and smooth picking dynamic. 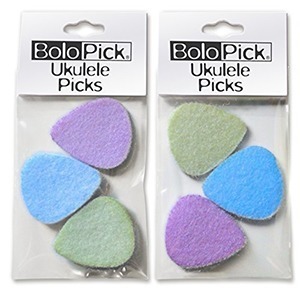 If you happen to be a ukulele player, we believe that the BoloPick is the right choice for you. 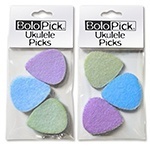 Available in very cheap packages of 6, these picks are specially adjusted for ukuleles, featuring a standard 351 shape, but a significantly smaller size and softer construction. They come with a standard thickness of 3 mm which happens to work like a charm with ukuleles, securing a mellow, bright and authentic sound. If you're just looking for a stylish pick at a very affordable price, by all means consult Bestpriceam! Crafted from celluloid, these .46 mm picks come with a size of 31 x 27 x 0.46 mm, featuring a solid build and a very, very low price. If you need disposable picks, we say get one 20-pack of these and never worry about running out of picks again. Neat stuff! With a catalog of over 50 different pick models and constant innovations in guitar pick manufacturing, Dunlop is arguably the go-to guitar pick manufacturer in the industry. 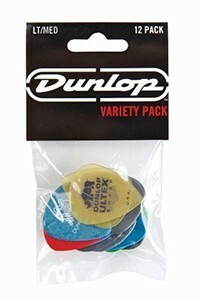 And the Dunlop 12 Pick Variety Pack offers both beginner and experienced guitar players the opportunity to sample some of Dunlop’s most iconic and popular pick models. The 12 packs are available in Light/Medium Gauge packs as well as Medium/Heavy gauge packs and offer players room to experiment in terms of pick gauge, material, grip and shape. When someone asks us to name the best mixture of quality build and affordable price in the pick realm, we often point to Dunlop PVP102. Available in packs of 12 and made in the US of A, this item is one of the company's most popular products, bringing you a sharp and accurate groove that will rock the house both on electric and acoustic models. 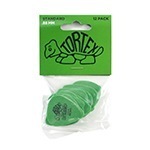 One pack includes the following picks: .88 and 1.0 Tortex; .90 and 1.14 Ultex Sharp; Heavy Celluloid; Red Nylon Jazz III; .88 and 1.0 Nylon Standard; .88 and 1.14 Max Grip, as well as .96 and 1.14 Gator Grip. 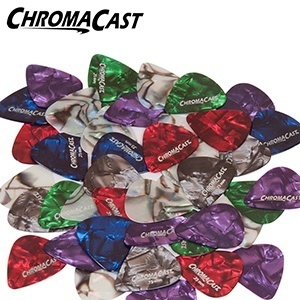 If you are looking for a LOT of picks, we say get yourself a pack of ChromaCast Pearl Celluloid picks. They come in batches of 48, featuring solid plastic and the ability to secure a warm and fat tone. One pack comes with 12 light gauge, 24 medium gauge and 12 heavy gauge guitar picks. They're available in a variety of colors, featuring a beautiful classic finish. As far as guitar picks go, not a lot of specific models stand out as iconic or legendary, but the Tortex pick from Dunlop is definitely one of them. Used by a variety of players around the globe, this fella is frequently hailed as the ultimate rock pick, featuring a standardized .88mm thickness and renowned Tortex construction to secure a long life. If you strum hard and don't like picks that get worn out after a week, give this one a spin. Wrapping things up with bright and punchy Nylon Standard, we bring you our choice for the best acoustic guitar pick. These puppies are very sleek and light, yet firmly grip to your fingers. Available in a variety of gauges (.38, .46, .60, .73, .88, and 1.0 mm), this pick is ideal for players that like their sonic attack bright and clear. Test 'em out and see how they fit! 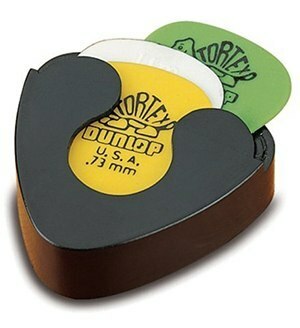 The Dunlop 5005 pick holder is a useful little pick holder that comes complete with a piece of mounting tape that allows you to attach it to the back of your guitar; which, unless you plan on fumbling around your pockets during a gig or while in the studio, is a must-have accessory for any guitarist. 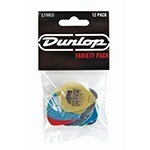 What’s also great about the Dunlop 5005 is that it’s able to hold both standard and unorthodoxly shaped picks. When all is combined, each of these products stands out as a strong contender for the title of the best guitar pick. It is now up to you to jot down your personal preferences and single out the model that fits your needs to a tee. Once that is out of the way, start practicing, start jamming,start playing!